Haulbooty Product Reviews: Real Shopping Help: (Product Review) Premium Masala Green Chai Tea- Organic and Pure Darjeeling Loose Leaf with The Best Indian Spices. 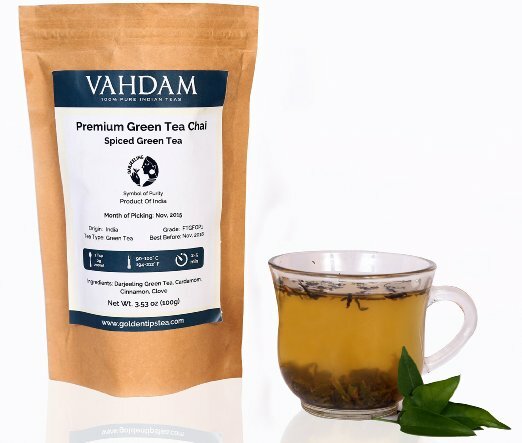 (Product Review) Premium Masala Green Chai Tea- Organic and Pure Darjeeling Loose Leaf with The Best Indian Spices. I am an avid tea drinker and recently purchased this Premium Masala Green Chai Tea- Organic and Pure Darjeeling Loose Leaf with The Best Indian Spices.Includes powerful health promoting Antioxidants (Makes 50 Cups)- 3.53oz- By VAHDAM from Golden Tips Teas. This fresh tea smells wonderful while brewing, and the taste is even better. I am currently enjoying a nice hot cup of this green tea with cardamon and cloves. The taste is great and the ingredients are all natural and boast of health benefits including maintaining dental health, relieving stress, improving sleep and detoxifying the body. I know that it has helped me relax through some stressful situations that I have been dealing with. I love that this tea comes with a generous 50 servings in a resealable bag which keeps it very fresh. I would recommend this tea to anyone, and if you like it a little sweeter you can add sugar if you like.